I must admit, I was a bit skeptical at first, even as I got off the elevator. I was referred to this full service salon by an associate, and boy was I impressed. The staff was extremely professional, informative, and friendly. I was immediately greeted with smiles and a tour of the salon by marketing director, Dawn. Le Skintique is not only home to skin specialist Regina, who by the way has the most phenomenal skin EVER, but has hair stylists, a nail technician, and a massage therapist. There's also a boutique where you're sure to find a jazzy outfit for mom or a cute pair of earrings and a funky bag for yourself, all handmade by fashion designer Barbara Cole. Regina then blew me away with the most detail-oriented and thorough, yet relaxing, facial I've ever had. It was absolutely amazing. This Saturday from 12pm-6pm, Le Skintique will have an Open House with a free skin analysis, hors d'oeuvres, and champagne. Go check it out and make an appointment for the Le Skintique signature facial or the new stress relief facial. Tell them Kandyce from L.A., etc. sent ya! 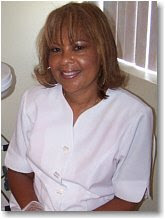 Le Skintique is located at 1620 Centinela Ave, Suite 302 in Inglewood. Right off of La Cienega. Call (310) 337-9555 or click on the title link for a list of services and prices.